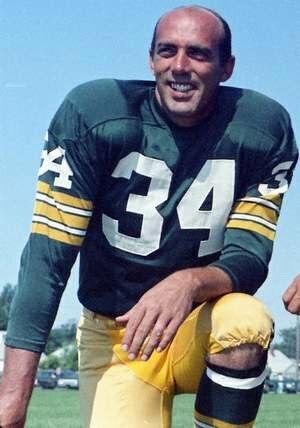 Another of the Lombardi-Era Packers has left us today. 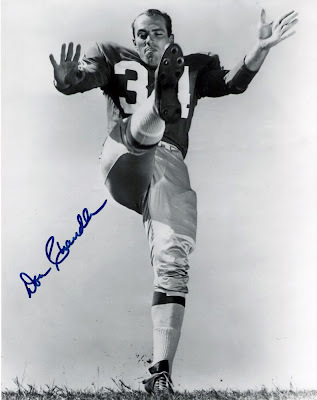 Don Chandler, who kicked and punted Green Bay to three N.F.L. championships (1965, 1966, 1967), died in Tulsa, Oklahoma on Thursday at the age of 76 from cancer. 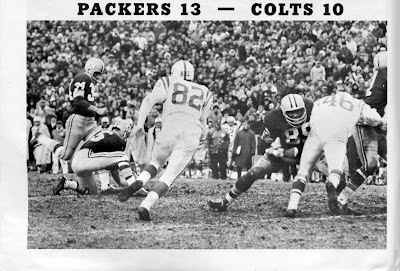 Before he came to the upper midwest to add to the accomplishments of the Sixties’ legends from Titletown, Chandler played first for the New York Giants (1956-1964), and will no doubt be remembered there as fondly as he is in Green Bay. 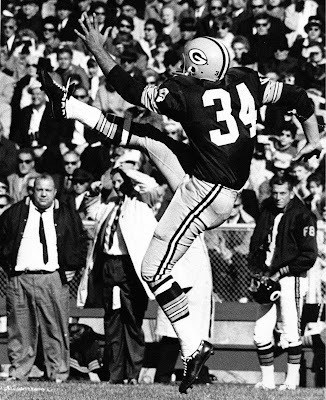 Above, he is shown punting against the Packers in the 1962 N.F.L. championship game in Yankee Stadium. 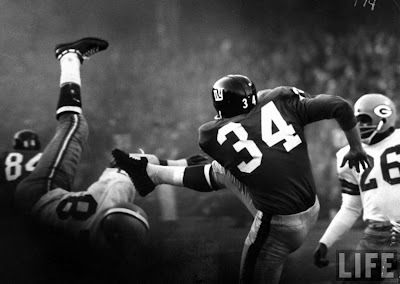 One of his most famous kicks came in the 1965 playoff against the Baltimore Colts, where his disputed regulation kick (was it wide or not?) sent the game into overtime. He then won the game with another less controversial field goal. 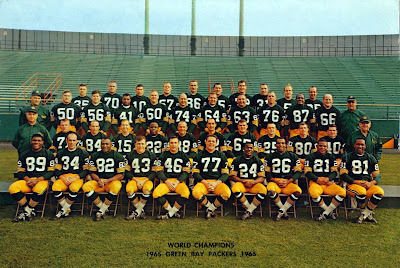 Chandler, second from left in the front row (#34), is seen with his 1965 championship mates. Chandler in his Packer colors. We wish they’d bring back those long-sleeved uniforms. 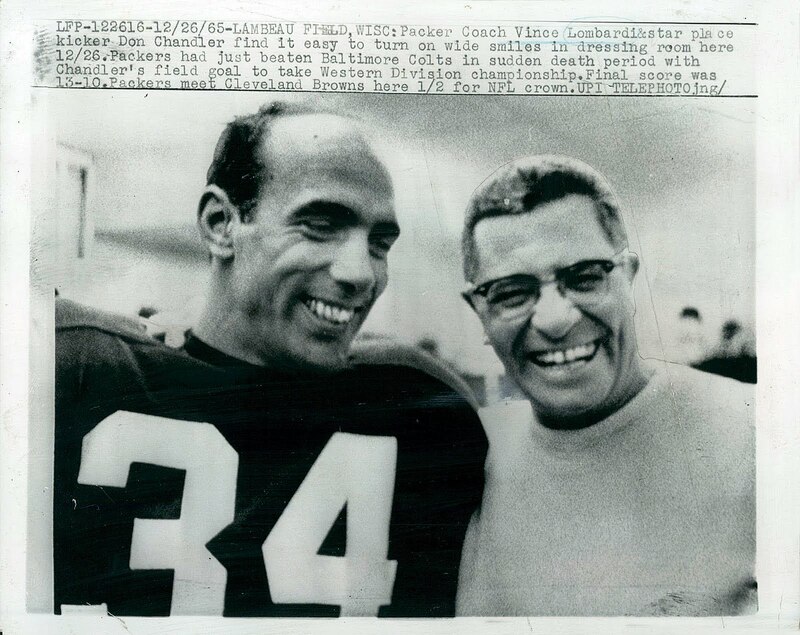 Chandler in the locker room with head coach Vince Lombardi after the 1965 playoff win. 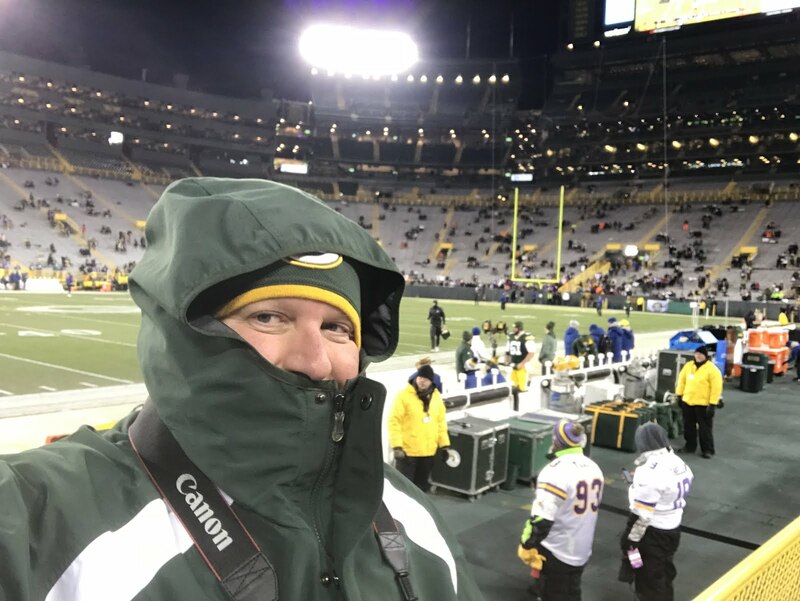 Chandler punts in Lambeau Field. In this last photo, Chandler shows his punting form in a New York Giants uniform. 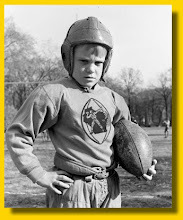 After college, he was selected in the fifth round (fifty-seventh pick overall) of the 1956 NFL Draft, and played with the New York Giants and Green Bay Packers. 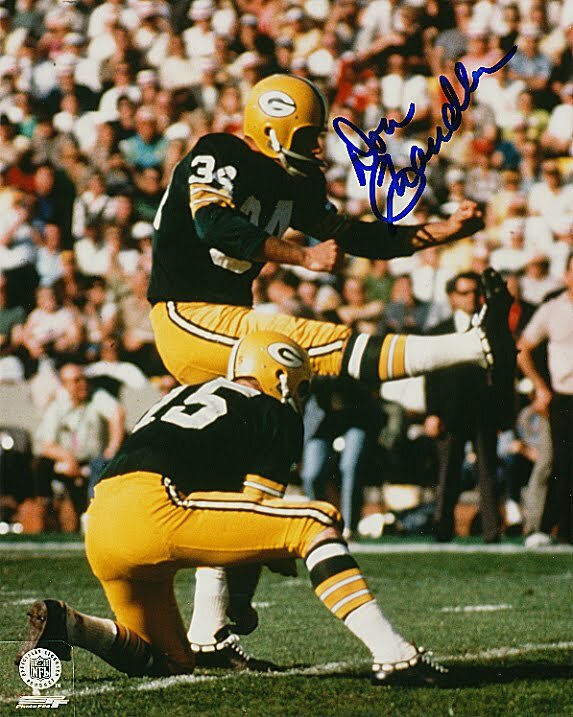 He played in the first two overtime games ever in the NFL, in 1958 with the Giants against the Baltimore Colts and again in 1965 when he kicked the winning field goal for the Packers against the same Colts in a Western Conference playoff game at Green Bay. Chandler's fourth-quarter field goal that tied the game at 10-10 stirred controversy, as many Baltimore players and fans thought he missed the kick to the right. Chandler was named the punter on the NFL 1960s All-Decade Team. He went to the Pro Bowl after the 1967 season. 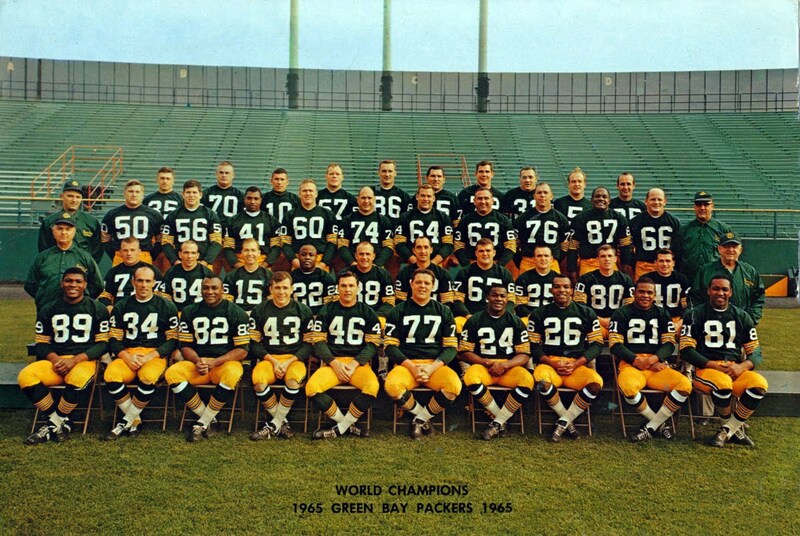 Chandler helped coach Vince Lombardi's Green Bay Packers teams win Super Bowls I and II. He holds the modern day record for the NFL's longest punt, ninety yards against San Francisco in 1965. He was named to the All Pro team in 1967. 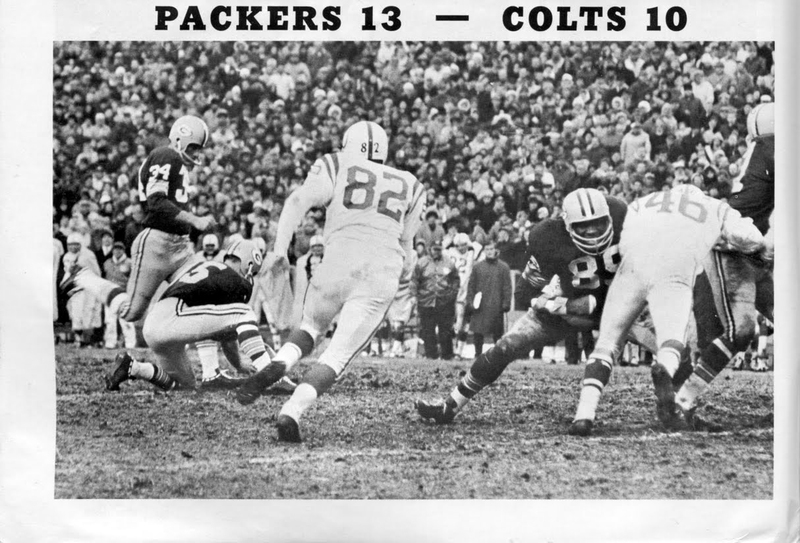 Chandler was inducted into the Packer Hall of Fame in 1975, along with tight end Ron Kramer, defensive end Willie Davis, guards Jerry Kramer and Fuzzy Thurston and Vince Lombardi. Chandler was selected as the premier punter for the decade in the 1960s. In 2002, he was named to the Oklahoma Team of the Century by The Oklahoman and in 2003 to the list of Oklahoma's Greatest Athletes by the Tulsa World. Chandler is also a member of the Oklahoma Sports Hall of Fame and the New York Giants Wall of Fame. Another great one from our youth is in heaven. 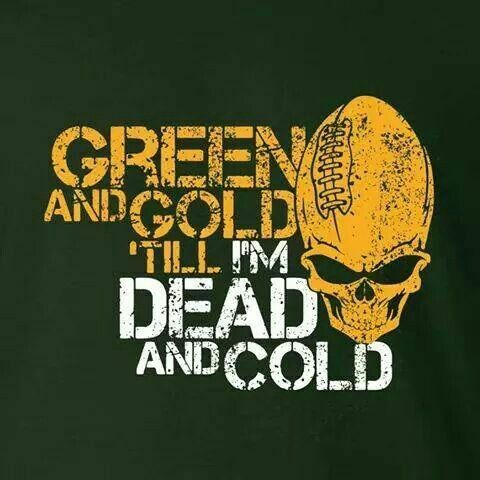 Thank you for three of the best years any Packer's Fan could ask for. R.I.P. Let’s Go Get Those Chiefs!